Eversion carotid endarterectomy (eCEA) involves oblique transection of the internal carotid artery (ICA) at its origin at the carotid bifurcation, followed by extirpation of the plaque by means of eversion and subsequent reimplantation of the ICA into the carotid bulb. It has been validated in randomized and nonrandomized prospective studies as a safe and effective surgical treatment for carotid stenosis. The efficacy of surgical treatment of atherosclerotic carotid stenosis in the prevention of stroke is well documented. The reference standard for calculation of the degree of carotid artery stenosis is based on the North American Symptomatic Carotid Endarterectomy Trial (NASCET) criteria (see the image below). In this approach, the smallest residual lumen at the level of stenosis is compared with the normal distal ICA lumen by means of catheter-based arteriography. North American Symptomatic Carotid Endarterectomy Trial (NASCET) criteria. Convention for describing carotid stenosis is to compare lumen diameter at most narrow point to diameter of internal carotid artery in normal segment several centimeters distal to stenosis. An alternative (though one that is less frequently used during catheter-based arteriography) is to determine the degree of the carotid artery stenosis by using the European Carotid Surgery Trial (ECST) criteria. In the ECST approach, the smallest residual lumen at the level of stenosis is compared with the local estimated diameter of the carotid bulb. A 70% carotid stenosis calculated according to the NASCET criteria corresponds to an 85% carotid stenosis calculated according to the ECST criteria. 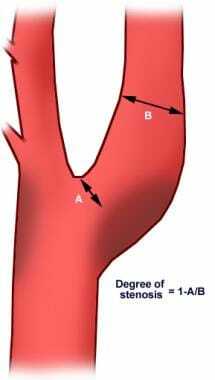 By the NASCET criteria, moderate stenosis is defined as 50-69% stenosis and severe stenosis as 70-99%. By the ECST criteria, the corresponding values are 75-84% for moderate stenosis and 85-99% for severe. A. Arterial flow (red) is displayed in internal carotid artery (ICA) and common carotid artery (CCA). Sampling for flow velocities and spectral waveform analysis is carried out in center stream of ICA, and waveform is shown below. Peak systolic and end-diastolic velocities are measured on representative wave. B. Same general area is being interrogated in diseased ICA. Lumen appears to narrow, and red color becomes variegated and lighter. Arterial flow is sampled in area of maximal disturbance and narrowing, and resultant waveform is displayed below. 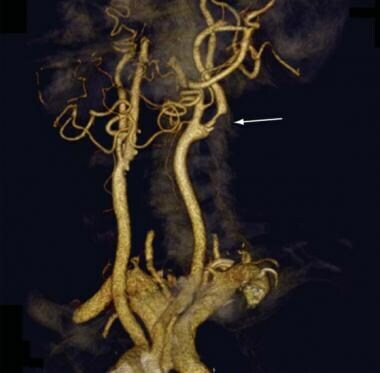 Representative image of extracranial circulation obtained with CT angiography and 3-dimensional reconstruction. Arrow points to stenosis in left internal carotid artery. Underlying etiology of carotid artery stenosis is formation of atheromatous plaque at bifurcation of common carotid artery and in origins of internal carotid artery. The reduction in the radius of carotid blood vessels has a significant negative effect on cerebral perfusion, in that blood flow through these vessels, as determined by Poiseuille’s law, is directly related to the fourth power of their radius. A. Simplified flow patterns at carotid bifurcation demonstrate complex reversal of flow along posterior wall of carotid sinus. This region is most vulnerable to plaque development. B. Established plaque at carotid bifurcation. C. Soft, central necrotic core with overlying thin fibrous cap. This area is prone to plaque rupture. D. Disruption of fibrous cap allows necrotic cellular debris and lipid material from central core to enter lumen of internal carotid artery, thus becoming atherogenic emboli. Patient may experience symptoms (transient ischemia, stroke, or amaurosis fugax) or remain asymptomatic, depending on site of lodgment and extent of tissue compromise. E. Empty necrotic core becomes deep ulcer in plaque. Walls of ulcer are highly thrombogenic and reactive with platelets. This leads to thromboembolism in internal carotid artery circulation. 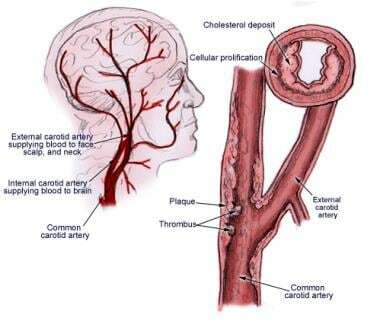 Extracranial cerebrovascular atherosclerosis, which accounts for most carotid artery disease, is responsible for 15-52% of all ischemic strokes. [42, 43] Hypertension is another important cause of stroke. Other rare entities of carotid artery disease include fibromuscular dysplasia, arterial kinking secondary to elongation, extrinsic compression, carotid body tumors, traumatic occlusion, intimal dissection, and radiation. In NASCET, the 5-year incidence of ipsilateral stroke was 15.7% in patients with moderate stenosis treated surgically, compared with 22.2% in patients with moderate stenosis who received optimal medical therapy. NASCET also demonstrated a cumulative risk of ipsilateral stroke of 26% and 9% at 2-year follow-up in patients treated medically and those treated with CEA, respectively. This reduction in the incidence of stroke in the CEA group was demonstrated in patients with symptomatic, high-grade stenosis (ie, 70-99%). Similarly, ECST data demonstrated that the 3-year risk of ipsilateral stroke was 2.8% in patients randomized to undergo CEA and 16.8% in those randomized to receive medical therapy alone. The 3-year risk of disabling or fatal stroke or death was 6.0% and 11.0% for surgically and medically treated patients, respectively. Both patient cohorts were symptomatic and had high-grade carotid stenosis. In the Asymptomatic Carotid Atherosclerosis Study (ACAS), a randomized clinical trial from North America comparing best medical therapy with surgery in 1622 asymptomatic patients with carotid artery stenosis, CEA significantly reduced the overall 5-year risk of ipsilateral stroke and any perioperative stroke or death from 11.0% to 5.1% in patients with asymptomatic carotid stenosis greater than 60%. This corresponded to a relative risk reduction of 53% and an absolute risk reduction of approximately 1% per year. A Cochrane review of the literature that included close to 2500 patients from five controlled clinical trials found that eCEA was associated with a lower risk of restenosis than patch angioplasty CEA. Data from the same study showed no significant differences between the two groups with respect to the rate of perioperative stroke (1.7% for eCEA and 2.4% for patch angioplasty) and perioperative mortality (2.0% and 1.9%). In 2014, Ballotta et al published results of a study that evaluated 2007 consecutive primary CEAs in 1773 patients over 12 years. ACAS and NASCET recommendations were used as inclusion criteria for asymptomatic and symptomatic patients, respectively. Of the 2007 patients, 1446 (72.1%) were symptomatic at the time of surgery. All procedures were performed by the same surgeon in patients under general anesthesia. Intraoperative electroencephalography was used for the assessment of cerebral perfusion and need for the selective shunting. During the study,  there were nine (0.47%) asymptomatic late carotid restenoses (six moderate [50%-69%] and three severe [≥70%]) and one (0.05%) carotid occlusion. Data from Kaplan-Meyer analysis showed the rates of freedom from restenosis and/or occlusion to be 99.9±0.1% at 1 year, 99.3±0.2% at 5 years, 99.3±0.2% at 10 years, and 99.3±0.2% at 12 years. Data also showed a perioperative stroke rate of 0.4% and no intraoperative mortality. This study demonstrated that eCEA can be performed in both asymptomatic and symptomatic patients with extremely low perioperative morbidity and mortality, as well as low restenosis rates. In 2018, Paraskevas et al published an updated systematic review and meta-analysis aimed determining whether eCEA confers significant benefit over conventional CEA. They found eCEA to be superior with respect to perioperative outcomes (stroke, death, death/stroke) and late restenosis but did not find a significant difference between it and patched CEA with regard to either early or late outcomes. Their data suggested that early and late outcomes after conventional CEA are similar to those after eCEA, provided that the arteriotomy is patched. The choice of surgical technique for the treatment of carotid artery stenosis should depend on the clinical judgment, experience, and preference of the operating surgeon, in the context of a discussion of the options with the patient. Benjamin EJ, Virani SS, Callaway CW, et al, American Heart Association Council on Epidemiology and Prevention Statistics Committee and Stroke Statistics Subcommittee. Heart Disease and Stroke Statistics-2018 Update: A Report From the American Heart Association. Circulation. 2018 Mar 20. 137 (12):e67-e492. [Medline]. [Full Text]. Lopez AD, Mathers CD, Ezzati M, Jamison DT, Murray CJ. Global and regional burden of disease and risk factors, 2001: systematic analysis of population health data. Lancet. 2006 May 27. 367(9524):1747-57. [Medline]. Matsumoto N, Whisnant JP, Kurland LT, Okazaki H. Natural history of stroke in Rochester, Minnesota, 1955 through 1969: an extension of a previous study, 1945 through 1954. Stroke. 1973 Jan-Feb. 4 (1):20-9. [Medline]. Sacco RL, Wolf PA, Kannel WB, McNamara PM. Survival and recurrence following stroke. The Framingham study. Stroke. 1982 May-Jun. 13 (3):290-5. [Medline]. Kleindorfer D, Panagos P, Pancioli A, Khoury J, Kissela B, Woo D, et al. Incidence and short-term prognosis of transient ischemic attack in a population-based study. Stroke. 2005 Apr. 36 (4):720-3. [Medline]. Bonita R, Stewart A, Beaglehole R. International trends in stroke mortality: 1970-1985. Stroke. 1990 Jul. 21(7):989-92. [Medline]. Gasparis AP, Ricotta L, Cuadra SA, Char DJ, Purtill WA, Van Bemmelen PS. High-risk carotid endarterectomy: fact or fiction. J Vasc Surg. 2003 Jan. 37(1):40-6. [Medline]. [Guideline] Ricotta JJ, Aburahma A, Ascher E, Eskandari M, Faries P, Lal BK, et al. Updated Society for Vascular Surgery guidelines for management of extracranial carotid disease. J Vasc Surg. 2011 Sep. 54 (3):e1-31. [Medline]. [Full Text]. Moore WS, Barnett HJ, Beebe HG, Bernstein EF, Brener BJ, Brott T. Guidelines for carotid endarterectomy. A multidisciplinary consensus statement from the Ad Hoc Committee, American Heart Association. Circulation. 1995 Jan 15. 91(2):566-79. [Medline]. de Bray JM, Baud JM, Delanoy P, et al. Reproducibility in ultrasonic characterization of carotid plaques. Cerebrovasc Dis. 1998 Sep-Oct. 8(5):273-7. [Medline]. Arnold JA, Modaresi KB, Thomas N, Taylor PR, Padayachee TS. Carotid plaque characterization by duplex scanning: observer error may undermine current clinical trials. Stroke. 1999 Jan. 30(1):61-5. [Medline]. Montauban van Swijndregt AD, Elbers HR, Moll FL, de Letter J, Ackerstaff RG. Ultrasonographic characterization of carotid plaques. Ultrasound Med Biol. 1998 May. 24(4):489-93. [Medline]. Salonen JT, Salonen R. Ultrasound B-mode imaging in observational studies of atherosclerotic progression. Circulation. 1993 Mar. 87(3 Suppl):II56-65. [Medline]. AbuRahma AF, Richmond BK, Robinson PA, Khan S, Pollack JA, Alberts S. Effect of contralateral severe stenosis or carotid occlusion on duplex criteria of ipsilateral stenoses: comparative study of various duplex parameters. J Vasc Surg. 1995 Dec. 22(6):751-61; discussion 761-2. [Medline]. Fujitani RM, Mills JL, Wang LM, Taylor SM. The effect of unilateral internal carotid arterial occlusion upon contralateral duplex study: criteria for accurate interpretation. J Vasc Surg. 1992 Sep. 16(3):459-67; discussion 467-8. [Medline]. Busuttil SJ, Franklin DP, Youkey JR, Elmore JR. Carotid duplex overestimation of stenosis due to severe contralateral disease. Am J Surg. 1996 Aug. 172(2):144-7; discussion 147-8. [Medline]. Legemate DA. Overestimation of a stenosis in the internal carotid artery by duplex sonography caused by an increase in volume flow. J Vasc Surg. 1999 Apr. 29(4):756. [Medline]. van Everdingen KJ, van der Grond J, Kappelle LJ. Overestimation of a stenosis in the internal carotid artery by duplex sonography caused by an increase in volume flow. J Vasc Surg. 1998 Mar. 27(3):479-85. [Medline]. Maldonado TS. What are current preprocedure imaging requirements for carotid artery stenting and carotid endarterectomy: have magnetic resonance angiography and computed tomographic angiography made a difference?. Semin Vasc Surg. 2007 Dec. 20(4):205-15. [Medline]. Wintermark M, Jawadi SS, Rapp JH, Tihan T, Tong E, Glidden DV. High-resolution CT imaging of carotid artery atherosclerotic plaques. AJNR Am J Neuroradiol. 2008 May. 29(5):875-82. [Medline]. Yuan C, Mitsumori LM, Ferguson MS, Polissar NL, Echelard D, Ortiz G. In vivo accuracy of multispectral magnetic resonance imaging for identifying lipid-rich necrotic cores and intraplaque hemorrhage in advanced human carotid plaques. Circulation. 2001 Oct 23. 104(17):2051-6. [Medline]. Fabiano S, Mancino S, Stefanini M, Chiocchi M, Mauriello A, Spagnoli LG. High-resolution multicontrast-weighted MR imaging from human carotid endarterectomy specimens to assess carotid plaque components. Eur Radiol. 2008 Dec. 18(12):2912-21. [Medline]. Mathiesen EB, Bonaa KH, Joakimsen O. Echolucent plaques are associated with high risk of ischemic cerebrovascular events in carotid stenosis: the tromsø study. Circulation. 2001 May 1. 103(17):2171-5. [Medline]. Pedro LM, Pedro MM, Gonçalves I, et al. Computer-assisted carotid plaque analysis: characteristics of plaques associated with cerebrovascular symptoms and cerebral infarction. Eur J Vasc Endovasc Surg. 2000 Feb. 19(2):118-23. [Medline]. Das M, Braunschweig T, Muhlenbruch G, Mahnken AH, Krings T, Langer S. Carotid plaque analysis: comparison of dual-source computed tomography (CT) findings and histopathological correlation. Eur J Vasc Endovasc Surg. 2009 Jul. 38(1):14-9. [Medline]. O'Leary DH, Polak JF, Kronmal RA, Manolio TA, Burke GL, Wolfson SK Jr. Carotid-artery intima and media thickness as a risk factor for myocardial infarction and stroke in older adults. Cardiovascular Health Study Collaborative Research Group. N Engl J Med. 1999 Jan 7. 340 (1):14-22. [Medline]. Chambless LE, Folsom AR, Clegg LX, Sharrett AR, Shahar E, Nieto FJ. Carotid wall thickness is predictive of incident clinical stroke: the Atherosclerosis Risk in Communities (ARIC) study. Am J Epidemiol. 2000 Mar 1. 151(5):478-87. [Medline]. Lorenz MW, von Kegler S, Steinmetz H, Markus HS, Sitzer M. Carotid intima-media thickening indicates a higher vascular risk across a wide age range: prospective data from the Carotid Atherosclerosis Progression Study (CAPS). Stroke. 2006 Jan. 37(1):87-92. [Medline]. Norris EJ. Anesthesia for vascular surgery. Miller RD, ed. Miller’s Anesthesia. Philadelphia: Churchill Livingstone Elsevier; 2010. 1985-2044. Bogousslavsky J, Van Melle G, Regli F. The Lausanne Stroke Registry: analysis of 1,000 consecutive patients with first stroke. Stroke. 1988 Sep. 19(9):1083-92. [Medline]. Fryer JA, Myers PC, Appleberg M. Carotid intraplaque hemorrhage: the significance of neovascularity. J Vasc Surg. 1987 Oct. 6(4):341-9. [Medline]. Arroyo LH, Lee RT. Mechanisms of plaque rupture: mechanical and biologic interactions. Cardiovasc Res. 1999 Feb. 41(2):369-75. [Medline]. McCarthy MJ, Loftus IM, Thompson MM, Jones L, London NJ, Bell PR. Angiogenesis and the atherosclerotic carotid plaque: an association between symptomatology and plaque morphology. J Vasc Surg. 1999 Aug. 30(2):261-8. [Medline]. Montauban van Swijndregt AD, Elbers HR, Moll FL, de Letter J, Ackerstaff RG. Cerebral ischemic disease and morphometric analyses of carotid plaques. Ann Vasc Surg. 1999 Sep. 13(5):468-74. [Medline]. Carr S, Farb A, Pearce WH, Virmani R, Yao JS. Atherosclerotic plaque rupture in symptomatic carotid artery stenosis. J Vasc Surg. 1996 May. 23(5):755-65; discussion 765-6. [Medline]. Inzitari D, Eliasziw M, Gates P, Sharpe BL, Chan RK, Meldrum HE. The causes and risk of stroke in patients with asymptomatic internal-carotid-artery stenosis. North American Symptomatic Carotid Endarterectomy Trial Collaborators. N Engl J Med. 2000 Jun 8. 342(23):1693-700. [Medline]. Timsit SG, Sacco RL, Mohr JP, Foulkes MA, Tatemichi TK, Wolf PA. Early clinical differentiation of cerebral infarction from severe atherosclerotic stenosis and cardioembolism. Stroke. 1992 Apr. 23(4):486-91. [Medline]. Risk of stroke in the distribution of an asymptomatic carotid artery. The European Carotid Surgery Trialists Collaborative Group. Lancet. 1995 Jan 28. 345(8944):209-12. [Medline]. Chu B, Kampschulte A, Ferguson MS, Kerwin WS, Yarnykh VL, O'Brien KD. Hemorrhage in the atherosclerotic carotid plaque: a high-resolution MRI study. Stroke. 2004 May. 35(5):1079-84. [Medline]. Lusby RJ, Ferrell LD, Ehrenfeld WK, Stoney RJ, Wylie EJ. Carotid plaque hemorrhage. Its role in production of cerebral ischemia. Arch Surg. 1982 Nov. 117(11):1479-88. [Medline]. Mofidi R, Crotty TB, McCarthy P, Sheehan SJ, Mehigan D, Keaveny TV. Association between plaque instability, angiogenesis and symptomatic carotid occlusive disease. Br J Surg. 2001 Jul. 88(7):945-50. [Medline]. Pessin MS, Duncan GW, Mohr JP, Poskanzer DC. Clinical and angiographic features of carotid transient ischemic attacks. N Engl J Med. 1977 Feb 17. 296(7):358-62. [Medline]. Mohr JP. Transient ischemic attacks and the prevention of strokes. N Engl J Med. 1978 Jul 13. 299(2):93-5. [Medline]. Eastcott HH, Pickering GW, Rob CG. Reconstruction of internal carotid artery in a patient with intermittent attacks of hemiplegia. Lancet. 1954 Nov 13. 267(6846):994-6. [Medline]. Jones CE, Jescovitch AJ Jr, Kahn A, Walters GK, Johnson CJ. Technical results from the eversion technique of carotid endarterectomy. Am Surg. 1996 May. 62(5):361-5. [Medline]. Shah DM, Darling RC 3rd, Chang BB, Paty PS, Kreienberg PB, Lloyd WE. Carotid endarterectomy by eversion technique: its safety and durability. Ann Surg. 1998 Oct. 228(4):471-8. [Medline]. Cao P, Giordano G, De Rango P, Zannetti S, Chiesa R, Coppi G, et al. A randomized study on eversion versus standard carotid endarterectomy: study design and preliminary results: the Everest Trial. J Vasc Surg. 1998 Apr. 27 (4):595-605. [Medline]. Vanmaele R, Van Schil P, De Maeseneer M. Closure of the internal carotid artery after endarterectomy: the advantages of patch angioplasty without its disadvantages. Ann Vasc Surg. 1990 Jan. 4(1):81-4. [Medline]. Raithel D, Kasprzak PM. The eversion endarterectomy-a new technique. Greenhalgh RM, Hollier LJ, eds. Surgery for Stroke. London: WB Saunders; 1993. 183-91. Randomised trial of endarterectomy for recently symptomatic carotid stenosis: final results of the MRC European Carotid Surgery Trial (ECST). Lancet. 1998 May 9. 351(9113):1379-87. [Medline]. Chaturvedi S, Bruno A, Feasby T, Holloway R, Benavente O, Cohen SN. Carotid endarterectomy--an evidence-based review: report of the Therapeutics and Technology Assessment Subcommittee of the American Academy of Neurology. Neurology. 2005 Sep 27. 65(6):794-801. [Medline]. Stoner MC, Abbott WM, Wong DR, Hua HT, Lamuraglia GM, Kwolek CJ. Defining the high-risk patient for carotid endarterectomy: an analysis of the prospective National Surgical Quality Improvement Program database. J Vasc Surg. 2006 Feb. 43(2):285-295; discussion 295-6. [Medline]. Matsen SL, Chang DC, Perler BA, Roseborough GS, Williams GM. Trends in the in-hospital stroke rate following carotid endarterectomy in California and Maryland. J Vasc Surg. 2006 Sep. 44(3):488-95. [Medline]. LaMuraglia GM, Brewster DC, Moncure AC, Dorer DJ, Stoner MC, Trehan SK. Carotid endarterectomy at the millennium: what interventional therapy must match. Ann Surg. 2004 Sep. 240(3):535-44; discussion 544-6. [Medline]. Ballotta E, Da Giau G, Piccoli A, Baracchini C. Durability of carotid endarterectomy for treatment of symptomatic and asymptomatic stenoses. J Vasc Surg. 2004 Aug. 40(2):270-8. [Medline]. Moore WS, Kempczinski RF, Nelson JJ, Toole JF. Recurrent carotid stenosis : results of the asymptomatic carotid atherosclerosis study. Stroke. 1998 Oct. 29(10):2018-25. [Medline]. Halliday A, Mansfield A, Marro J, Peto C, Peto R, Potter J. Prevention of disabling and fatal strokes by successful carotid endarterectomy in patients without recent neurological symptoms: randomised controlled trial. Lancet. 2004 May 8. 363(9420):1491-502. [Medline]. Berguer R. Eversion endarterectomy of the carotid bifurcation. Veith FJ, ed. Current Critical Problems in Vascular Surgery. St Louis: Quality Medical Publishing; 1993. vol 5: 441-7. Bosse A, Ansorg P, Mayer B, Mulch J. Eversion endarteriectomy of the internal carotid artery. Thorac Cardiovasc Surg. 1991 Dec. 39(6):371-5. [Medline]. Reigner B, Reveilleau P, Gayral M, Papon X, Enon B, Chevalier JM. Eversion endarterectomy of the internal carotid artery: midterm results of a new technique. Ann Vasc Surg. 1995 May. 9 (3):241-6. [Medline]. Darling RC 3rd, Paty PS, Shah DM, Chang BB, Leather RP. Eversion endarterectomy of the internal carotid artery: technique and results in 449 procedures. Surgery. 1996 Oct. 120(4):635-9; discussion 639-40. [Medline]. Koskas F, Kieffer E, Bahnini A, Ruotolo C, Rancurel G. Carotid eversion endarterectomy: short- and long-term results. Ann Vasc Surg. 1995 Jan. 9(1):9-15. [Medline]. Kasprzak PM, Raithel D. Eversion carotid endarterectomy. Technique and early results. J Cardiovasc Surg. 1989. 30:495. Cao P, Giordano G, De Rango P, Zannetti S, Chiesa R, Coppi G. Eversion versus conventional carotid endarterectomy: late results of a prospective multicenter randomized trial. J Vasc Surg. 2000 Jan. 31(1 Pt 1):19-30. [Medline]. Cao P, De Rango P, Zannetti S. Eversion vs conventional carotid endarterectomy: a systematic review. Eur J Vasc Endovasc Surg. 2002 Mar. 23(3):195-201. [Medline]. Ballotta E, Toniato A, Da Giau G, Lorenzetti R, Da Roit A, Baracchini C. Durability of eversion carotid endarterectomy. J Vasc Surg. 2014 May. 59 (5):1274-81. [Medline]. Schneider JR, Helenowski IB, Jackson CR, Verta MJ, Zamor KC, Patel NH, et al. A comparison of results with eversion versus conventional carotid endarterectomy from the Vascular Quality Initiative and the Mid-America Vascular Study Group. J Vasc Surg. 2015 May. 61 (5):1216-22. [Medline]. Ben Ahmed S, Daniel G, Benezit M, Ribal JP, Rosset E. Eversion carotid endarterectomy without shunt: concerning 1385 consecutive cases. J Cardiovasc Surg (Torino). 2017 Aug. 58 (4):543-550. [Medline]. Paraskevas KI, Robertson V, Saratzis AN, Naylor AR. Editor's Choice - An Updated Systematic Review and Meta-analysis of Outcomes Following Eversion vs. Conventional Carotid Endarterectomy in Randomised Controlled Trials and Observational Studies. Eur J Vasc Endovasc Surg. 2018 Apr. 55 (4):465-473. [Medline]. AbuRahma AF. Processes of care for carotid endarterectomy: surgical and anesthesia considerations. J Vasc Surg. 2009 Oct. 50(4):921-33. [Medline]. GALA Trial Collaborative Group, Lewis SC, Warlow CP, Bodenham AR, Colam B, Rothwell PM, et al. General anaesthesia versus local anaesthesia for carotid surgery (GALA): a multicentre, randomised controlled trial. Lancet. 2008 Dec 20. 372 (9656):2132-42. [Medline]. McCleary AJ, Dearden NM, Dickson DH, Watson A, Gough MJ. The differing effects of regional and general anaesthesia on cerebral metabolism during carotid endarterectomy. Eur J Vasc Endovasc Surg. 1996 Aug. 12(2):173-81. [Medline]. Gough MJ, Bodenham A, Horrocks M, Colam B, Lewis SC, Rothwell PM. GALA: an international multicentre randomised trial comparing general anaesthesia versus local anaesthesia for carotid surgery. Trials. 2008. 9:28. [Medline]. Gomes M, Soares MO, Dumville JC, Lewis SC, Torgerson DJ, Bodenham AR. Cost-effectiveness analysis of general anaesthesia versus local anaesthesia for carotid surgery (GALA Trial). Br J Surg. 2010 Aug. 97(8):1218-25. [Medline]. Bond R, Rerkasem K, AbuRahma AF, Naylor AR, Rothwell PM. Patch angioplasty versus primary closure for carotid endarterectomy. Cochrane Database Syst Rev. 2004. CD000160. [Medline]. Mannheim D, Weller B, Vahadim E, Karmeli R. Carotid endarterectomy with a polyurethane patch versus primary closure: a prospective randomized study. J Vasc Surg. 2005 Mar. 41(3):403-7; discussion 407-8. [Medline]. Counsell C, Salinas R, Warlow C, Naylor R. Patch angioplasty versus primary closure for carotid endarterectomy. Cochrane Database Syst Rev. 2000. (2):CD000160. [Medline]. Bond R, Rerkasem K, Naylor AR, Aburahma AF, Rothwell PM. Systematic review of randomized controlled trials of patch angioplasty versus primary closure and different types of patch materials during carotid endarterectomy. J Vasc Surg. 2004 Dec. 40(6):1126-35. [Medline]. De Bakey Me, Crawford ES, Cooley DA, Morris GC Jr. Surgical considerations of occlusive disease of innominate, carotid, subclavian, and vertebral arteries. Ann Surg. 1959 May. 149(5):690-710. [Medline]. Etheredge SN. A simple technic for carotid endarterectomy. Am J Surg. 1970 Aug. 120 (2):275-8. [Medline]. Kieny R, Hirsch D, Seiller C, Thiranos JC, Petit H. Does carotid eversion endarterectomy and reimplantation reduce the risk of restenosis?. Ann Vasc Surg. 1993 Sep. 7(5):407-13. [Medline]. Darling RC 3rd, Mehta M, Roddy SP, Paty PS, Kreienberg PB, Ozsvath KJ. Eversion carotid endarterectomy: a technical alternative that may obviate patch closure in women. Cardiovasc Surg. 2003 Oct. 11(5):347-52. [Medline]. Entz L, Jaranyi S, Nemes A. Eversion endarterectomy in surgery of the internal carotid artery. Cardiovasc Surg. 1996 Apr. 4(2):190-4. [Medline]. Shah DM, Darling RC 3rd, Chang BB, Paty PS, Kreienberg PB, Lloyd WE, et al. Carotid endarterectomy by eversion technique: its safety and durability. Ann Surg. 1998 Oct. 228 (4):471-8. [Medline]. LYONS C, CLARK LC Jr, MCDOWELL H, MCARTHUR K. CEREBRAL VENOUS OXYGEN CONTENT DURING CAROTID THROMBINTIMECTOMY. Ann Surg. 1964 Oct. 160:561-7. [Medline]. Larson CP, Ehrenfeld WK, Wade JG, et al. Jugular venous oxygen saturation as an index of adequacy of cerebral oxygenation. Surgery. 1967. 62:31. Harris EJ, Brown WH, Pavy RN, Anderson WW, Stone DW. Continuous electroencephalographic monitoring during carotid artery endarterectomy. Surgery. 1967 Sep. 62(3):441-7. [Medline]. Baker JD, Gluecklich B, Watson CW, Marcus E, Kamat V, Callow AD. An evaluation of electroencephalographic monitoring for carotid study. Surgery. 1975 Dec. 78(6):787-94. [Medline]. Trojaborg W, Boysen G. Relation between EEG, regional cerebral blood flow and internal carotid artery pressure during carotid endarterectomy. Electroencephalogr Clin Neurophysiol. 1973 Jan. 34(1):61-9. [Medline]. Friedman JA, Anderson RE, Meyer FB. Techniques of intraoperative cerebral blood flow measurement. Neurosurg Focus. 2000. 9(5):e4. [Medline]. Lam AM, Manninen PH, Ferguson GG, Nantau W. Monitoring electrophysiologic function during carotid endarterectomy: a comparison of somatosensory evoked potentials and conventional electroencephalogram. Anesthesiology. 1991 Jul. 75(1):15-21. [Medline]. Wellman BJ, Loftus CM, Kresowik TF, Todd M, Granner MA. The differences in electroencephalographic changes in patients undergoing carotid endarterectomies while under local versus general anesthesia. Neurosurgery. 1998 Oct. 43(4):769-73; discussion 773-5. [Medline]. Cho I, Smullens SN, Streletz LJ, Fariello RG. The value of intraoperative EEG monitoring during carotid endarterectomy. Ann Neurol. 1986 Oct. 20(4):508-12. [Medline]. Manninen PH, Tan TK, Sarjeant RM. Somatosensory evoked potential monitoring during carotid endarterectomy in patients with a stroke. Anesth Analg. 2001 Jul. 93(1):39-44. [Medline]. Salvian AJ, Taylor DC, Hsiang YN, Hildebrand HD, Litherland HK, Humer MF. Selective shunting with EEG monitoring is safer than routine shunting for carotid endarterectomy. Cardiovasc Surg. 1997 Oct. 5(5):481-5. [Medline]. van der Schaaf IC, Horn J, Moll FL, Ackerstaff RG,. Transcranial Doppler monitoring after carotid endarterectomy. Ann Vasc Surg. 2005 Jan. 19(1):19-24. [Medline]. Gaunt ME, Martin PJ, Smith JL, Rimmer T, Cherryman G, Ratliff DA. Clinical relevance of intraoperative embolization detected by transcranial Doppler ultrasonography during carotid endarterectomy: a prospective study of 100 patients. Br J Surg. 1994 Oct. 81(10):1435-9. [Medline]. Ackerstaff RG, Jansen C, Moll FL, Vermeulen FE, Hamerlijnck RP, Mauser HW. The significance of microemboli detection by means of transcranial Doppler ultrasonography monitoring in carotid endarterectomy. J Vasc Surg. 1995 Jun. 21(6):963-9. [Medline]. Spencer MP. Transcranial Doppler monitoring and causes of stroke from carotid endarterectomy. Stroke. 1997 Apr. 28(4):685-91. [Medline]. Moore WS, Hall AD. Carotid artery back pressure: a test of cerebral tolerance to temporary carotid occlusion. Arch Surg. 1969 Dec. 99(6):702-10. [Medline]. Krul JM, van Gijn J, Ackerstaff RG, Eikelboom BC, Theodorides T, Vermeulen FE. Site and pathogenesis of infarcts associated with carotid endarterectomy. Stroke. 1989 Mar. 20(3):324-8. [Medline]. Bond R, Rerkasem K, Counsell C, et al. Routine or selective carotid artery shunting for carotid endarterectomy (and different methods of monitoring in selective shunting). Cochrane Database Syst Rev. 2002. CD000190. [Medline]. Veroux P, Giaquinta A, Ardita V, D'Arrigo G, De Marco E, Veroux M. Surgical Treatment of Residual Distal Intimal Flap during Eversion Carotid Endarterectomy. Ann Vasc Surg. 2017 Aug. 43:347-350. [Medline]. Patient is placed in supine position with hyperextension of neck. Head is rotated 15-20° away from operating side to face contralateral to side of lesion. This maneuver is used to move mandible superiorly, to expose mediolateral aspect of neck, and to open up angle of access to anterior neck triangles at side of lesion. Operating area is cordoned off with 4 sterile drapes. It is essential to incorporate ear lobe and mastoid process (superiorly), neck midline (medially), and sternoclavicular joint (inferiorly) into surgical field. Incision is created over anterior border of sternocleidomastoid muscle, along line connecting sternocleidoclavicular junction with processus mastoideus, preserving great auricular nerve superiorly and carried down to carotid sheath. This is the position of the incision for optimal exposure of common carotid artery, internal carotid artery, and external carotid artery. Skin incision is deepened through subcutaneous fat and platysma. Platysma is divided longitudinally. This gains access to investing layer of deep cervical fascia, which is incised along anterior border of sternocleidomastoid muscle. Sternocleidomastoid muscle is retracted posteriorly to expose carotid sheath. Dissection of carotid sheath is carried low on neck, along medial aspect of internal jugular vein. Initial incision of carotid sheath should be performed carefully to avoid injury to vagus nerve, which is located anterior to carotid artery 10% of time. Facial vein is landmark for carotid bifurcation in vast majority of patients. It courses across common carotid artery and drains into internal jugular vein. Facial vein is mobilized, suture-ligated, and divided. After division of common facial vein, internal jugular vein is retracted laterally to yield clear exposure of underlying common carotid artery and internal carotid artery. Circumferential exposure of common carotid artery is required only for arterial segment where vessel loops are to be placed; great care must be taken posteriorly, where vagus nerve is anticipated to be encountered in majority of patients. External carotid artery is dissected free of surrounding tissue and encircled with colored vessel loop, as is proximal superior thyroid artery. Internal carotid artery lies posterolaterally in carotid sheath. Common facial vein branch of internal jugular vein marks site of carotid bifurcation. After division of facial vein, internal jugular vein is retracted posteriorly to expose carotid bifurcation. Before mobilization of internal carotid artery, hypoglossal nerve should be identified and preserved. Transection of internal carotid artery (ICA) is performed with pair of Stephens scissors. Crook of scissors is placed at carotid bifurcation with blades oriented inferolaterally to encircle artery. ICA is transected with sharp, oblique, and complete cut. Transection of internal carotid artery (ICA) will lead to exposure of atheromatous plaque within ICA lumen. Under direct vision, plaque is reached with DeBakey forceps. With gentle and constant downward traction on plaque (top), outer arterial layer of internal carotid artery (ICA) is peeled back (everted) to deliver plaque (middle). Eversion should be maintained with forceps holding edges of transected artery constantly (bottom). This will allow facilitated manipulation of transected arterial end and subsequent anastomosis of proximal ICA with common carotid artery. Extraction of atheromatous plaque from internal carotid artery. After extraction of atheromatous plaque, everted edges, as well as lumen of proximal internal carotid artery, are carefully inspected for residual debris and well irrigated with heparinized saline. After plaque extraction from internal carotid artery, attention is directed to common carotid artery and external carotid artery. Optimal plane of dissection lies between intima and circular fibers of media. This endarterectomy plane allows smooth distal tapering of endpoint. Spatula is passed behind plaque to isolate it from adventitial plane on opposite side of common carotid artery. After plaque extraction, lumen and edges of common carotid artery and external carotid artery are thoroughly inspected for residual atheromatous plaques and any debris and generously irrigated with normal saline. Double-armed continuous 6-0 polypropylene suture is used for end-to-side anastomosis. Creation of end-to-side anastomosis (using "heel first, toe last" technique) begins with stitch at proximal end of the artery (heel), with one arm penetrating through transected internal carotid artery and other arm through proximal bifurcation. Back wall of anastomosis is completed with continuous suture ending in internal carotid artery. Front wall of anastomosis is completed in same manner as back wall, from distal to proximal. Before completion of arterial closure, each clamp is released individually to flush out any residual debris. Newly created anastomosis. 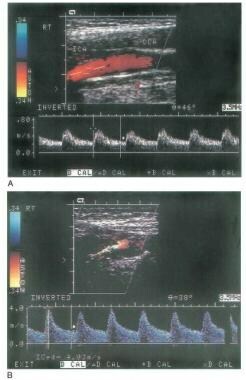 Duplex ultrasonography is performed to verify technical result of procedure and to assess patency of carotid vasculature. Before closure is begun, Blake drain is placed through separate stab incision. Only deep layer to be approximated is platysma. Platysma is closed with 2-0 monofilament absorbable suture. For closure of skin, subcuticular technique with 4-0 monofilament absorbable suture is used; this provides skin closure with excellent cosmetic results.